On Redchurch Street, London, Ptblnk ._ opened its pop-up shop with a poolside theme that exemplifies their new collected called Dive In. Although the pop-up store itself is already turning heads, what is found inside is a different story. Yanyu Chung and Adrienne Lau are the creative geniuses behind Ptblnk ._. The brand is described to be a “design collective that creates fun projects in a multidisciplinary approach” and there is definitely no shortage of fun here. 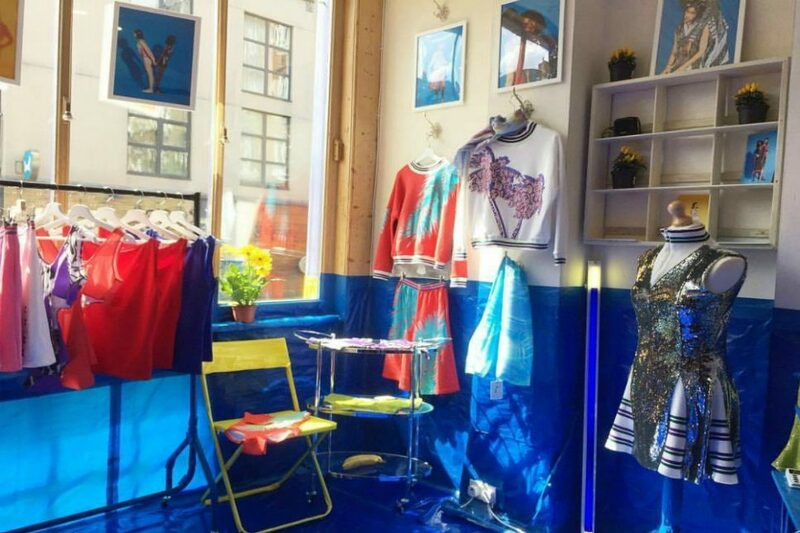 The pop-up shop boasts of a poolside vibe seen through the blue rubble sacks covering one-third of the wall, making it look like the clothes are floating. What’s more is that Chung and Lau made it more creative through using only oilcloth and tape. They admitted that they didn’t have the budget to make a week-long pop-up space, but through using cheap and temporary aesthetics, they were able to manage. While they were able to take down the shop in just three hours, their sales didn’t stop there with consumers still purchasing online.